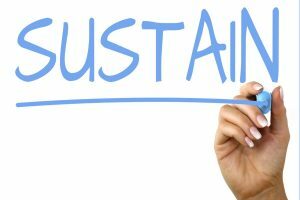 Sustainment is arguably one of the most challenging parts of a Kaizen, or more, the most challenging part of Post-Kaizen. It can sometimes be very easy to drop a new process when there is stress, even though the old process was stressful as well. However, the old process brought along stress that you became conditioned to, it produced a level of stress you were used to, versus a new stress. This tends to negate all the hard work you put into the Kaizen itself. Processes can be broken down, the improvement measured through its results, but what happens when you revert to old ways as soon as there is resistance? How does one keep themselves from back-sliding after making new improvements? 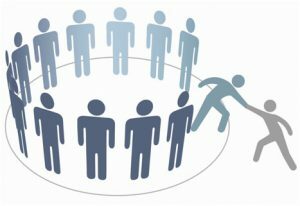 Involvement: One vital part of maintaining improvement is engagement of your entire team, the entire workforce involved with the process. Sustaining improvements isn’t the job of one, but it’s accomplished through the work and perseverance of many. When everyone is involved with a process and the completion of that process, then you have many people invested in its sustainment. When there is only one or two out of the whole who are invested in improvement, it becomes easier to revert, as everyone is not on the same page. 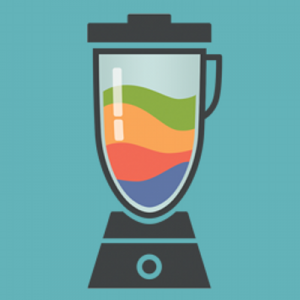 Metrics/Data: Evaluating your improvements and its progression is also important Post-Kaizen. The data and metrics collected through the Kaizen show the improvement itself, and go on to show the improvements growth afterwards. Data and metrics can help with sustainment in that they will show you where improvement is falling-off, or where adjustments need to be made. Part of the services our office provides was implementing a 2,4,6 month check-in for Kaizens, which go over the improvements that had originally been made and the data and metrics collected along the way. This allows everyone to visually see how the metrics flux, and whether the metrics values have gone up or down due to lack of adherence to the sustainment plan, or because the new process needs some PDCA. Evaluation: Sometimes, having many action items to complete Post-Kaizen contributes to a lack of sustainment. If one person becomes bogged down with many different tasks to complete, or if many tasks are put into place and later found in need of adjustments, the wheels for back-sliding may have already begun to turn. Having action items completed before the end of the Kaizen gives you time to collect metrics and data for the changes made, and therefore gives you time to evaluate the effects of those changes. If a large amount of the changes don’t get made, or the changes didn’t have the desired effect, it becomes very tempting to want to go back to the familiar “old-way”. Lean is all about testing the changes made In Real Time, so it’s important to give yourself time to evaluate the changes that are being made, their effects, as well as seeing that implementation doesn’t spread one person too thin. If it appears that one person is overburdened with action items, its okay to take it one item at a time, or to disperse the items in a different manner. Incorporation: Along with involving everyone in a process who has a say, you should also have a plan for incorporating this new improvement and knowledge into everyday culture. When approaching improvement and sustaining it, it’s helpful to have a mindset that revolves around continuous improvement. This allows for new ideas to be given, received, and applied in reaction to results. To help keep the thoughts from, “well, this isn’t working, lets just go back to the old way,” it’s more positive to think “if this doesn’t work, we can find something to try next.” When improvement is blended into one’s daily routine, it becomes easier to train someone who’s new to the process, as well as to hand-off the information down the road. This makes sure that improvements are not only sustained by those who were first involved, but those after as well. Continuous Improvement: Last but not least, improvement rarely is spot-on the first try, meaning Post-Kaizen improvements may not always go smoothly. There may be stress on the new process, unforeseen road bumps, or even resistance to something new. Remember that just because you spent time creating a new process, it does not mean that the new process is set in stone, and it will more-than-likely need improvements of its own. Never be afraid to make tweaks or ask, “how can we make this process even better?” Incremental improvement is just as effective as all other improvement efforts, don’t feel like it all has to be done at once, take the time to make improvements at a sustainable pace. Sustaining improvement is a tricky thing, but it’s a challenge well worth the fight! After all, you’re trying to become more effective in the service and value you provide. I have a lot more to say on the subject, however I will save that for another time. 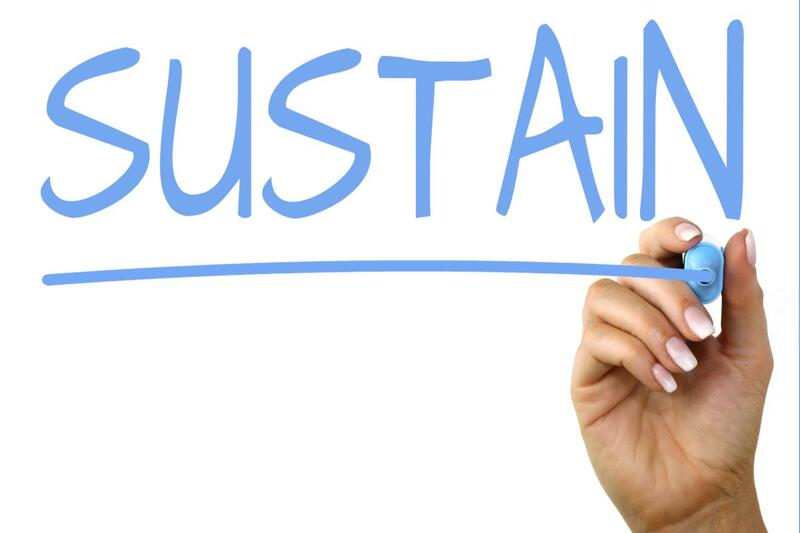 Please feel free to comment with any thoughts or experiences that you have with sustaining improvement! Data collection can be a tricky thing, especially in a Higher Education setting. We tend to have to get creative in identifying what data would be helpful in representing improvement, as well as how we can collect the data using the resources we already have. This need for creative thinking skills tends to make brainstorming a collection plan seem ambiguous and maybe even insignificant at times. In a video I recently watched, Mike Wroblewski, a senior consultant from the Kaizen Institute, shared a little bit about all the things we should consider before we create a data collection plan. The part that really stuck with me was his emphasis on going to the Gemba, the place where work is done, and asking questions. Wroblewski’s video showed me, that you can’t fully grasp the current state until you immerse yourself in the environment of the user, even if it is only observation. 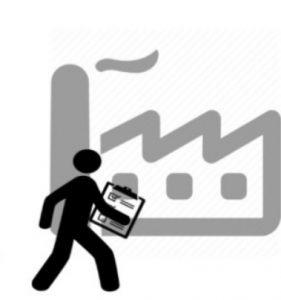 Once you’ve gone to the Gemba, it becomes more clear what the steps in the process are. 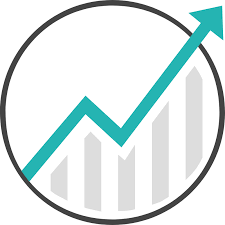 From here you can identify metrics that represent the frequency of an event, such as the number of corrections to file, or that represent importance. For example, how critical is it that this step be in the process at all. By now you’re probably thinking, “this is all great, but why do we even care about metrics?” Results. When you think of a research project, you want to know the results. When you missed the ending of a baseball game, you want to know the results. When you hear of someone applying for a new job, you want to hear the results. We as humans are hard wired around, “what happened next?” Lean and Continuous Improvement is no exception to this. When an improvement event is initiated, we soon begin talking about data collection before and after a kaizen so that we have results to showcase the work that was done. Metrics can be the difference between a department hypothetically getting $500 towards improvement efforts or $50,000. Metrics and results drive more people to put in the energy to improve their work from good to great. This outlook and approach towards data collection is one that our lean practitioners here on campus have been trying to implement more and more, as well creating a more systematic approach towards getting numbers easily, accurately, and that will also provide meaningful data. Most often, the trigger for PDCA is when you come across a barrier or an issue within a process. The signal to step into action and begin PDCA is once your current state no longer reflects your trajectory to the desired target state. So, what happens when you reach your target state and there is nothing left to improve? Trick question, there is ALWAYS something to improve! Recently within the Office of Continuous Improvement, we have been going through our own office standards and procedures. This week, during our second monthly office standard meeting we came up with a purpose statement for our meetings. 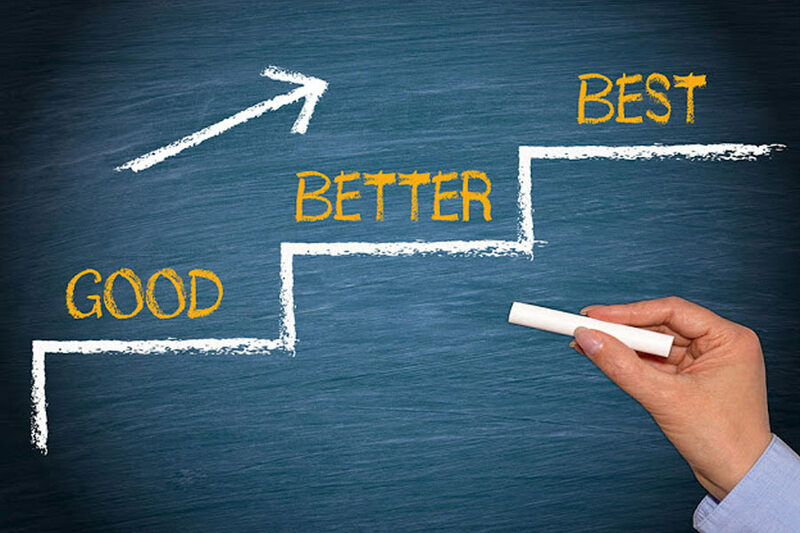 One of the criteria for the purpose statement is that we needed to capture the importance of continuous improvement towards perfection, and not just the kind improvement that occurs after an issue is identified. Currently, we’re reviewing the standards that we have found issues or road bumps with, in order to correct the issue as soon as possible. However, the monthly office standards meeting is also supposed to be a preemptive measure against road bumps for the future. Now that we’ve started to make improvement in the areas that need immediate attention, we will regularly check in and PDCA all of our processes. Instead of waiting until something is wrong with a process before working on it, our goal is to continually improve each standard we have implemented. This way, instead of needing a trigger, it’s already part of our on-going process. It may seem as though this is a waste of time, fixing something when it isn’t broke. However, we believe that taking the time to look over something before an issue arises, not only gives you more control over the situation, but it can also help alleviate any stress that often accompanies issues. For example, let’s say that you regularly check the fluid levels of your vehicle. If you notice the break fluid is extremely low, you now have a hint that something is wrong and because you take the time to check your vehicle regularly, you very well have just avoided an accident. Would it have been a better use of time if you had just waited until the brakes light came on? Or perhaps if your brakes blew out on the highway? In terms of safety and well-being, taking a few extra minutes here and there actually saves you time and stress later on, for your future self. That is the same with preemptive improvements. When you look ahead in anticipation of possible issues or areas of stress and take corrective measures beforehand, then you don’t have to deal with the crisis state. Overall, it’s helpful to remember that it’s important to look at what you may improve now, even though there may not be any foreseen issues yet. It’s not about what’s broken, but about whether or not there’s something that we can do to make sure it doesn’t break at all later, and in turn we get another step closer towards perfection in doing so. The Office of Continuous Improvement had the pleasure of welcoming guest Karyn Ross on Monday afternoon (and on her birthday, no less!). Having her here at Michigan Tech was a wonderful opportunity, as we get to learn more about Lean from another perspective. 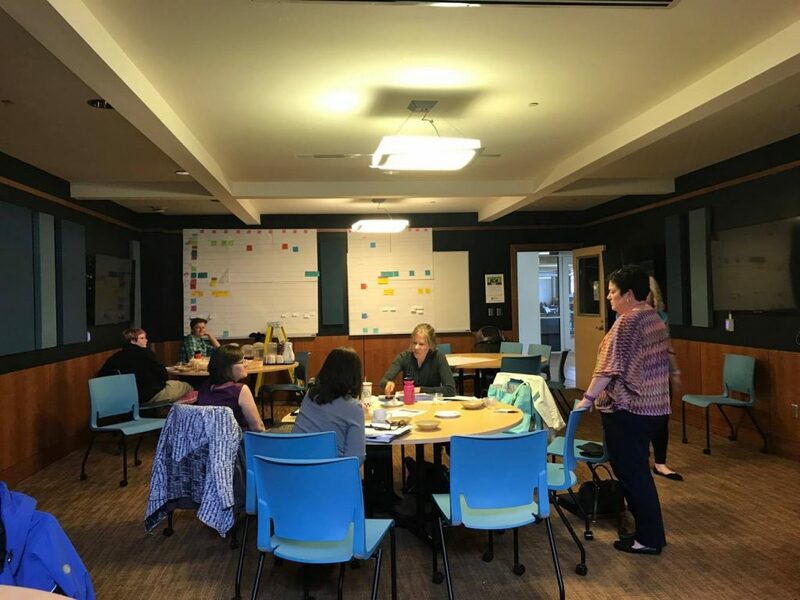 While talking with Karyn and students from Leaders in Continuous Improvement, Karyn was asked how to better cultivate a Lean culture, was there certain tools that they should be using. Karyn’s response was not what I expected, but I was also pleasantly intrigued, as she addressed our usage of tools and Lean culture in a way that allowed be to look at Lean in a way I hadn’t previously. In terms of tools, there are many that we have in order to help us make an improvement, and there tends to be heavy dependency on these tools. However, improvement is more than implementation of just a tool or tools: it’s the combination of principles, practice AND tools that allow us to accomplish an overall purpose. It is the establishment of the purpose that seems to have been forgotten, which means that an important key to improvement has been forgotten as well. When beginning an improvement event, the first step is to identify and evaluate the current state, when really we should be asking and establishing what our purpose for the improvement is. “What is it we want to accomplish? What do we need to do, in order to make that accomplishment? How can it be done in a way that fulfills our purpose?” Establishing your purpose allows you to be able to define your target of the improvement. Only after the purpose and your target are established can you truly look at your current state and start to find how to bridge the gaps. Only then can tools be used without creating waste. What did she mean, to flip the two? In most everything I had read about Lean, all that I had learned through training, the saying was always “efficient” and then “effective”. How could you be effective without being efficient first? Karyn went on to talk about that when a group works towards their purpose, and produces an end result that adds value to their customer, then they are being effective. The more value you produce for the customer, the more effective you are being, and the more you are fulfilling your purpose. Therefore, being more effective allows you to become more efficient, as you fulfill your purpose in the best, Lean way possible. Karyn was overall, engaging and knowledgeable, and I wish I had had more time to talk to her. I hope that now, with my new found knowledge about my own purpose within Lean, that I can help other people improve the world, and do so more effectively. One of my first solo kaizens has been with a group of newly trained facilitators, and has gone smoothly so far! I would like to share how during this particular kaizen, I witnessed this group really dig-down and think of tools and ways that would allow them to cover as many aspects of the root cause as possible. Recently, the IT library help-desk has been working on improving the hardware drop-off process. The process itself had issues such as miscommunication and lack of information and standards. This left the help-desk with no information about the hardware’s progress as well as other issues, such as the customer not knowing how to access what little information there was about their hardware. One of the challenges of going through this Kaizen was how often certain parts of the process were “Out-of-Scope” due to the process involving many other departments and people. Though IT could do their best to standardize the parts of the process that they were hands on, there was little that could be done at that time in terms of standardizing the process as a whole. As ways to address communication within IT and the customer, they came up with ideas such as information cards for customers specifically, as well as more details added to the hardware log. These two improvements helped a majority of the process in terms communication all around. Although it was established earlier that areas of the process that took place in and with other departments was out of scope, the team came up with a fairly simple idea that was still able to address the lack of communication and was able to help bridge between the current improvement and the out-of-scope. Their idea was to create a channel that allowed communication only between the main contacts of IT and the other heads of the process. 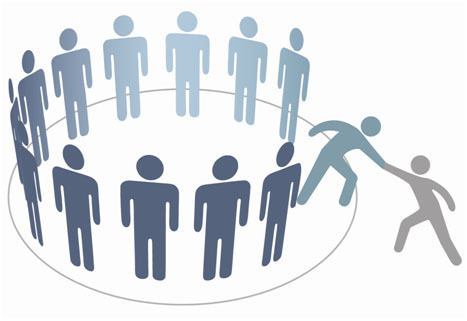 This way, there’s more effective communication between all groups involved in the process. It was very exciting and refreshing to see this group take on improvement in a creative way, in which they didn’t let the out-of-scope deter them from improving what they could. As we’ve shared in the past, each year 15-18 Michigan Tech faculty and staff come together in hopes of becoming the newest additions to our facilitator co-hort here on campus. To achieve the title of a “Level 1 Facilitator,” each candidate must attend seven days of training, complete various homework assignments, and participate as either a team leader or a facilitator on a new kaizen with three to four other candidates. 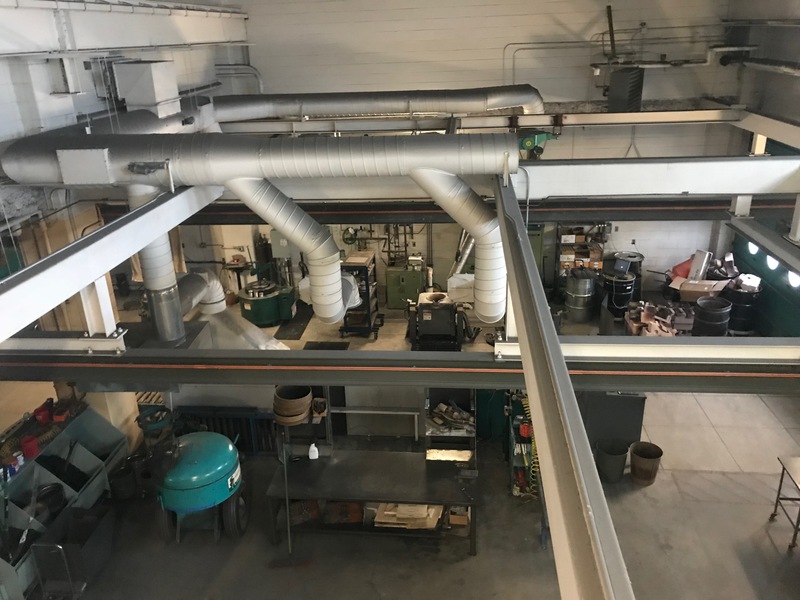 The group I’ve been assigned to has decided that their kaizen was going to be to 5S the Foundry Lab located in the Material Science and Engineering building. A couple of weeks ago, four future graduates, and an already seasoned facilitator, went to the gemba, where work is done. 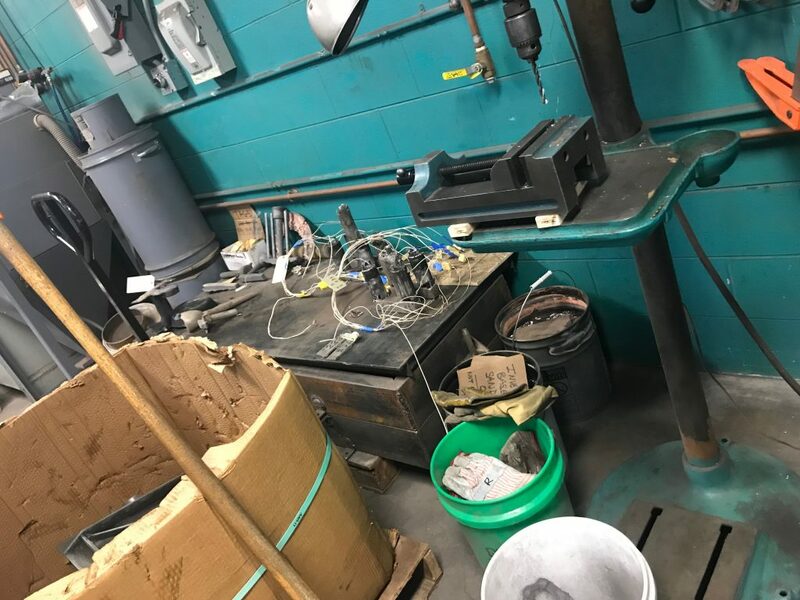 Our tour of the Foundry Lab consisted of Team Leader, Matthew Otte (Material Science and Engineering) walking us through the various workstations and processes for every corner of the lab. Our walk took a little over an hour and a half, and we really only scraped the surface for potential areas of improvement. This is the top view of the Foundry lab before any changes have been made. Following this Gemba walk I found myself a little overwhelmed by the magnitude of potential within the lab. I was struggling with imagining where, how and when to start. One of my favorite things about lean is that it has taught me to become an independent problem solver. When this overwhelming feeling creeped in I remembered that the most important thing with any change is to just start. There’s no rule that says you must jump from current state to ideal state in one step. Continuous Improvement is about incremental changes. It doesn’t matter how big the stride, what matters is the direction. Considering this, the team and I regrouped, and we decided to start with one single workbench and slowly pick away at other areas within the Foundry. This is a before picture of the finishing station workbench our team decided to start with. Now, these emotions I experienced weren’t necessarily circumstantial, however they’ve been encountered many times by many people and seem to be associated with any sort of change. Commonly, this sense of being overwhelmed is coupled with 5S. I’ve found that in most cases, when 5S is initiated, there’s usually a lot that needs to be done. These emotions can be used as a trigger to take a deep breath, and pick one incremental change at a time. There has been a new Kaizen started here in the Office of Continuous Improvement, and I get to be the PIC for it! The new Kaizen is through the JR Van Pelt and Opie Library. The topic will be based around the scheduling methods of conference room 103 in the Library. Chad Arney, Director of Strategic Initiatives, is the team leader. He has proven to be very knowledgeable, both in the understanding of Library itself and in Google calendar. Andrew Miles (Financial Aid Manager), Briana Tucker (Student Engagement Coordinator), and Lori Weir (Dir Admin Services & Projects) are the three facilitators that have volunteered for this Kaizen. An added bonus, is that they are all outside eyes, and often ask very formidable questions about the process for how to schedule the conference room. Our team members are Annelise Doll and Mia Kemppainen, both employees in the library who know the process inside and out, and work with it on a daily basis. We held our pre-meeting at the beginning of the March and identified what the problem was exactly. Chad explained the confusion and difficulty there was just to reserve the conference room, which believe me, was very confusing, especially for an outsider looking in. It was a bit unbelievable to see the process that people have to go through to reserve this room. Not only is there a lengthy process, but there is all the potential for other people to be in the room or that another reservation could be made, over-booking your event. We held our first Kaizen day this past Monday with the whole team together in one room. We were able to create a process map of what people have to do to reserve the room. We were also able to figure out some things in Google calendar that really none of us have really known about before, like knowing who can reserve the room on campus and how Google calendar can accept whether or not the room can be reserved. It was very interesting to learn about these new things I hadn’t known before. We were also able to identify the different things that people struggle with when reserving the room. Overall, it’s been, and hopefully will continue to be a fun, exciting, and great learning experience. From a young age we were taught to obey our elders, use our manners, and present ourselves in an appropriate manner. As we got older, more detail was added. Saying “please” and “thank you” wasn’t enough, we also had to treat others how we wanted to be treated, be kind, and help others when they needed it. Everyday, we add a little more detail to all of these areas, we learn a little bit more. What am I describing? Have you caught yourself saying it in your head? If you need to, reread this paragraph slower, then continue on. Did you catch it now? I’m describing respect. Respect is the foundation to every relationship we have. Whether it be with a spouse, a co-worker, a boss, a friend. The amount of relationships we have, are endless. Respect fuels these relationships and if the respect is lost, then often times so is the relationship (unless you actively try to rebuild it). Because respect is such a fundamental piece of human nature, I believe this is why Toyota made “Respect” one of it’s two pillars (the other being Continuous Improvement). This pillar is referred to as “Respect for People.” We’ve talked plenty before about respect for people, so instead I want to talk about how “Respect for People,” may have been a false translation when it was translated from Japanese to English. Before I totally throw you off, respect for humanity does indeed include respect for people, but “respect for people” simply doesn’t bring justice to the entirety of Toyota’s pillar. Some parts were lost in translation. When respect for humanity is broken down, it results in three areas: Respect for the workers, Respect for the customers and suppliers, and respect for the environment. All areas that human interaction is involved while producing, or consuming a product. Respect is a huge part of Lean, and that’s because it’s a huge part of life. Respect goes beyond our interactions between other humans, it involves our relationship with our products, ourselves, our homes, our world. Creating honest emotion, passion, and empowerment. Without respect, lean would fail, just like everything else does. Respect for people is important, but when we expand our respect beyond people, greater things are produced. “Respect For Humanity.” Lean manufacturing – Practical advice, information resourcesand, 2014, www.lean-manufacturing-junction.com/respect-for-humanity.html. Miller, Jon. “Respect for humanity…of your boss.” Gemba Academy, 10 Aug. 2015, blog.gembaacademy.com/2015/08/10/respect-for-humanity-of-your-boss/. 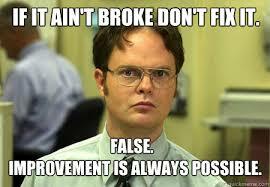 Here in the Office of Continuous Improvement, we are always striving to continuously improve in all of our activities. Recently, we were introduced to another opportunity to grow through a new practice (to us) called Incremental Improvement. Most often, our work consists of large massive sweeps of improvement, tackling large projects and issues with Kaizens. This calls for the scheduling large increments of time around multiple busy schedules. Daily office work usually includes dedicating chunks of time to a project until it’s complete, before moving on to the next project on the agenda. Incremental Improvement focuses on smaller solutions and actions when tackling large projects, and allows for completion through small steps and not leaps and bounds. It allows for easier implementation of ideas, which meets less resistance as any changes are slowly made and adjusted to. Changes implemented are less risky, and allows for PDCA on a smaller scale. Overall, the improvements made are done by the staff collectively, as they all have the knowledge and power to implement more beneficial improvements. 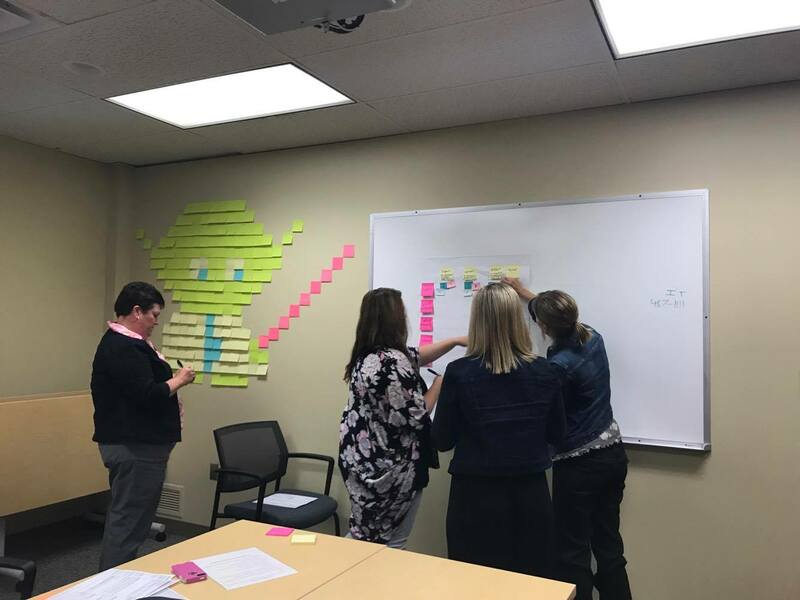 Right now, the Office of Continuous Improvement is working on a Lean Lending Library project, where we’re making a standardized activity check-out. This would allow anyone to come in and check-out a learning activity and have all the information and materials they would need in order to do the activity. We could see right away that it definitely would be a large project, but were ready to get down to business! At first, we wanted to just start tackling it head on, and initially figured someone would be assigned to work on the project with it as a priority. However, after being introduced to the concept of Incremental Improvement, we began looking at how we could break the monster project into smaller steps instead. Now we’re steadily going through each step, bit by bit. Small amounts of time are consistently made for us to work on the steps of the project, in comparison to someone working on it for large chunks of time when they’re able to. Already, the progress we have made is tangible, though there is still a lot more work to do. I personally have found that this large project is not so daunting now that it has been broken up, and is continuously being worked on bit by bit. I’m very excited to see the end results of our Incremental Improvements! For the last six months a team has been pulled together to address various areas of the commencement process here at Michigan Tech, from ticketing to safety, and from configuration of space to guest speakers. This team has covered the commencement process inside and out, and with all of the stakeholders involved too! That’s HUGE!! The team has met 13 times already, for a total of 20 hours, and they are just getting started on most of it. Before I introduce the teams let me tell a little bit more about how the Office of Continuous Improvement and the commencement committee have paired up and identified the kaizens that they’d like to move forward on. The meetings mentioned used swim lanes, a process mapping tool to map out the commencement process. The details to go on the swim lanes were acquired by the team leader, Kelly Vizanko, who emailed all of the stake holders and asked for their timelines. For the ones that were not received via email, they attended half-hour segments to help the team map out their part of the process. These meetings then identified areas of waste using kaizen bursts. From there the kaizen bursts were grouped based on the sub-process that they fell into and then later placed into a ICE Table, used for prioritization. This is how the kaizens were identified, by the most important/greatest impact, the level of control the team had, and by the ease to implement change/improvement. The kaizens identified were: Ticketing, Preparation, Volunteers, and Space + Configuration. This is a photo of Day one of the very first kaizen. This is half of the start of the swimlane that ended up being created. The Commencement Volunteers and Preparation kaizens are just about to take off, all we are waiting on is the dates to come (for the volunteer kaizen) and our team to be solidified for the preparation kaizen. Here is the team leaders and the facilitators working on prioritizing the kaizens. All in all, we have a ways to go on these kaizens but the goal is to have at least something changed in each of these areas by April 2018, and to reassess after this year’s commencement ceremony. A foot in the door for lean, just as the students are about to leave.